So what I am going to show you is not any sort of scheme or dodgy tricks, it really worked and I don´t waste more than 15 minutes on it every day. 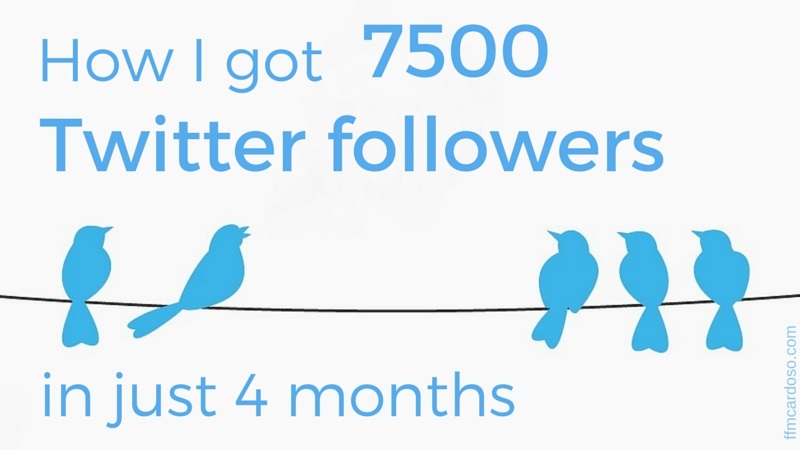 When I started this method to gain new followers on Twitter, what I wanted was to gain a bigger audience, but a REAL audience. I wanted to be followed by people that actually cared about my tweets and had the same interests as I. I don´t have any ambition of having followers that don´t interact just for the sake of having an impressive number. So I did some research on how to increase my audience and I came across this tool called Tweepi that I will explain you how you can use it to gain relevant followers and increase your presence on Twitter. The great thing about what I am about to show you is that you don´t only get more followers but also that you start following people that you actually care and want to follow as well so your networking on Twitter starts to work properly. This means that if you are sharing your posts on Twitter they start to reach bigger and more interested audiences. 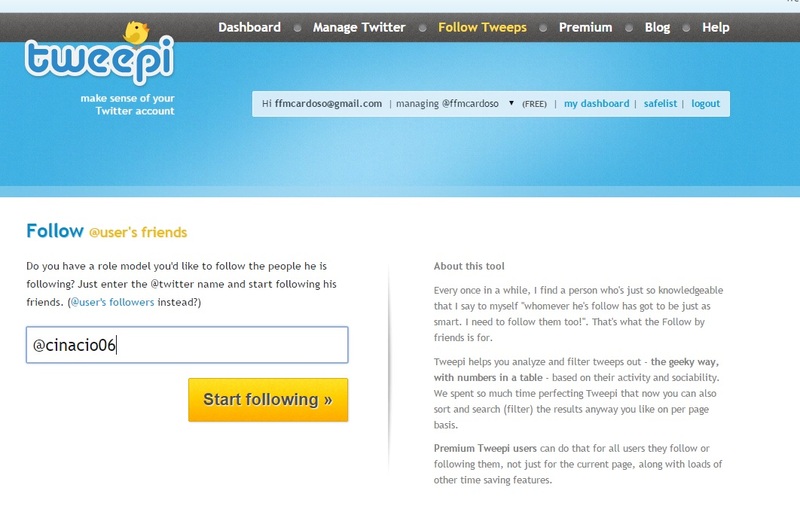 With Tweepi you can follow a big amount of people in just a few seconds. On the picture below you can see my growth curve in terms of followers over time. I have a Twitter account since July 2009 but only started to really use it in September 2014 (stupid I know). I started only to gain followers due to what I tweeted and a lot of both online and offline networking. But the bigger increase started when I discovered this tool. At the beginning I was just using it once in a while but then I started to use it everyday and that´s why you see a clear peak on the curve. With more followers I got more engagement, more impressions, more profile views, more mentions and more tweets linking to me as you can see on this report from Tweet Analytics from the last 28 days. But lets start from the basics. Some things you need to know before you start using this tool otherwise it won´t work so effectively. The first thing you need to ask yourself is what´s your goal on Twitter. Why do you want more followers? Why do you want people to follow you? And what sort of people do you want to follow. For instance, in my case, I want to follow anyone that is related somehow to Social Media, SEO, SEM, Content Marketing, Digital Marketing and Blogging. This is what I do for a living so I want to learn as much as possible from people that do what I do. I like to follow people with other interests as well like photography, design, architecture and Tourism and Travel just to mention a few. In order that people with the same interests as you follow you back you need to make sure that you provide that information on your profile. People will take 2 seconds (if much) to read your bio when you follow them, make sure that you input relevant information that make them wanting to follow you. This is what I have on my profile description. 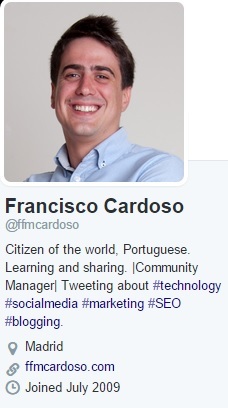 I state that I travel (citizen of the world), my nationality and what´s my purpose on Twitter (learning and sharing). Then I say what I do for a living and what I am sharing about. It´s good to say your location as well. You can use hashtags on your bio, it will help on Twitter searches. Last but not least, your profile picture. Make sure you use a picture where your face can be seen and it´s only you. No kids, pets or your loved on. Twitter is very different from Facebook and has a more “professional” approach (at least if you are not 15 and tweeting about your dramas in school), so it´s not a bad idea to have a more serious approach on your profile. I think cover picture is not as important but give it some thought as well. Try to have something that defines you as well and not just a random picture. For me the great thing about Facebook is that I can keep in touch with my family and friends all over the world. But the great advantage of Twitter is to be able to get access to a lot of good knowledge and relevant information. Your Tweets will play a relevant role on your presence on this Social Network. Make sure that what you tweet about what is relevant for your audience and not just for you. If your audience is interested on Marketing and Social Media, maybe they will not be very interested if you tweet about football results. Also make sure you don´t tweet everything at the same time, so schedule your Tweets with Buffer and use Feedly to add sources of shareable content. Make sure you always mention your sources where you get the content from. This will increase your visibility and is a good way to gain followers since they will be notified that you mention them. It will help if you share content with pictures like this example. Jeffrey kindly shared a Tweet from my last post, with picture, mention and also with an hashtag. This is the perfect way to share someone´s content. As you can see Jeffrey got 8 Re-Tweets and 15 favourites. He was happy, and I was happy too. After going through a little bit of basics on how to use Twitter lets move on to the fun part and how you can start to have more followers. 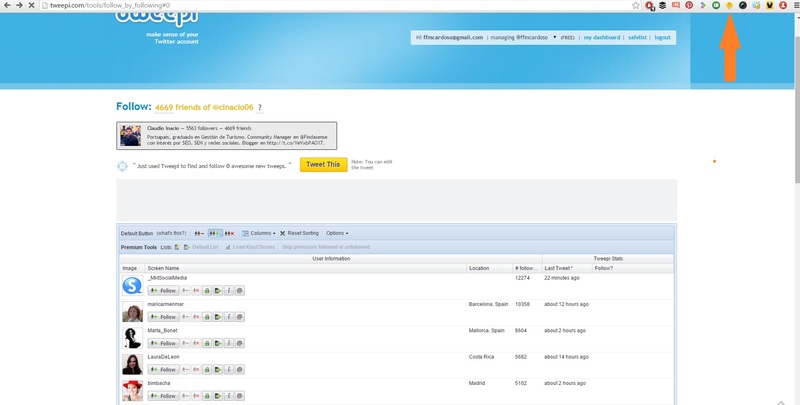 First thing you do is to open Tweepi and make sure you click on Login and then Log in with Twitter. Secondly you need to be using Chrome and download the Tweepi extension. In order to get more followers you need to start to follow people hoping that they follow back. Using this tool you can follow a lot of people very quickly. At this moment I am following 1000 new people every 24h, which is the maximum that Twitter allows. But lets say that you have 600 followers and you are following 400. I recommend you to follow 150/200 people per day in order that you don´t have more following than followers. The first step we need to take is to choose an account from someone that is somehow related to our interests. If you are in Spain you can find a great list here from Marketing and Web and if not, you can use Alianzo to browse for accounts. For this article I will use my friend´s and great blogger Claudio, since we have the same purpose on Twitter and the same interests is very likely that people will like to follow us both. 1 – Now, you will select Follow Tweeps and you have two options: User´s friends (people Claudio follows) or users followers. I tried both and got way better results following user´s friends. 2 -Type the account from whom you want the friends from and click on Start Following. And you will be presented with this list. 3 -Remember that I have asked you to install a Tweepi extension? Now is when we going to start using it and you should be having it by the right top corner where the orange arrow is pointin on the picture. By clicking on it you will start following every member on that list is just a few seconds. 5 -Repeat this procedure over and over till you follow as much people as you want per day. Remember not to follow more people than the amount that follows you. 6 -Try to follow new people everyday from different accounts and unfollow the ones that are not following back on the next day. I have realized that from each 1000 people I follow each day I have 150 to 250 new followers but this value only increased when I started to have a reasonable number of followers. The really neat thing of Tweepi, is that you can follow many people at once in just a few minutes. The problem is that you shouldn´t follow more people than the amount of followers you already have since you have less chances of people are following you back. You should stop following people that have zero relevance for you like inactive people, people that tweet things you don´t care or people with “egg faces”. There are other tools to manage your account like Social Bro or Manage Filter but with Tweepi you can unfollow your unfollowers very quickly. So go on Manage Twitter and Flush the Unfollowers and you will be taken to this list as shown on the picture. You see that you have a few columns on the right side, if you click on each of them the list will be reorder according to the column. I have clicked on “Last Tweet” which means that I am seeing a list of followers on ascending order from their last Tweet. But since any of them is following me back I will unfollow them as well. Just use the same procedure with the Chrome extension. Make sure you clean up your account regularly. Create Safelists – If you click on the small lock next to any user you will safe list it, meaning that you can neither follow or unfollow by mistake. Very important. Follow the first 10 of the list – I only follow the first 10 users of each list. To do that you can safe list the ones in the bottom 10 and run the extension. Follow people on lists – You can also follow people on someone´s lists. Just clic on Follow Tweeps and List Members . It´s a good way to start following influencers. Pin an Interesting tweet on your profile – Make sure you have an interesting tweet (preferably with a picture) pinned on your profile. Go to Twiiter native app, click on the three dots on the tweet you like and Pin it. This is the first thing people see when they check your TL. Choose a different account everyday – Try to choose different accounts to follow their friends or followers every day and check which ones work better. I have shown how I increased my Twitter account so quickly, and I hope you can use this method with your account. I don´t spend much more that 15 minutes per day doing this, but I make sure I do it everyday including weekends. So in order for this to work you need to make sure that you can commit to it a bit. Unless you are a Super Star or an Influencer you wont have thousands of people following you so you need to start following a big number of people in order that they can follow you back as well. Make sure you focus on getting a real and interested audience, there´s no point of having many followers if they don´t interact with you, quality is always much better than quantity. I would like to know what you thought about this. Did you know Tweepi? Have any more tricks? Or do you use other too to get more followers? If you started using this method share your results with here, I would love to know how you got on. Amazing post: thanks for sharing it! I have used in the past Manage Flitter (free) and Toolows (paid), but after testing Tweepi and following your tips in this post, I think I am going to use Tweepi every day! Jorge! Muchísimas gracias por tu comentario. Un crack como tu y con tantos seguidores en Twitter me encanta que te pueda aportar algo. Que ilusión! Te respondo en ¿español? ¡Como prefieras: es tu blog! Lo dicho: pedazo de post, súper útil, y muy bien explicado. Muchas gracias. Jorge tu me puedes responder en tus tres idiomas! 🙂 A ver que tal esta ese portugués! La extensión de Chrome creo que es fundamental, si ella Tweepi es un poco mas de lo mismo, creo. A mi me encanta que personas como tu y Victor que tengan un montón de trabajo y cosas que hacer saquen 10 minutos para hacer un comentario en un Blog. Flipé con la cantidad de contestaciones de Victor, eso es genial. Y tu comentario dentro del post aporta mucho valor, eso mola mucho a quien escribe el post, pero también a quien lo le. Me encanta cuando la aportación en un comentario es verdadera y aporta algo, no solo al autor del post pero a los lectores también. Eso es estar en las “redes” de una manera útil a todos y hay pocos como tu. Una vez mas, muchas gracias por todo. Ya he aprendido mucho contigo desde que empecé con esto todo. P.S. Que tal tu One-plus-One? Estoy esperando por el Project Ara de Google a ver que tal. Vou tentar com meu português do Brasil! Eu acho que esqueci muito: morei em Brasilia no ano 2004 & 2005. Não vou utilizar Google Translator: só as minhas lembranças, ok? O seu espanhol é perfeito: parabéns! Víctor Martín é para mim um modelo de blogger com não tem! Ele sempre deixa a sua resposta personal no seu blog: no 2011 e no 2015, isso é incredível para mim! Eu achava que meus “mega-comentarios” en outros blogs só eran lidos pelo autor do blog, não pelas outras pessoas! Fico um pouco com vergonha disso! Para mim é muito bonito ouvir que você aprendeu alguma coisa comigo: muito obrigado! Me alegro que te ha gustado! 😉 Dime como te va la cosa después! Enhorabuena Francisco, gran post! Como ya te lo he dicho para mi que soy un seguidor fiel de tu blog,este es tu mejor post! Tiene de todo: bastante contenido de valor, unos consejos fantásticos, lo explicas de maravilla y además con truquillos, que más se puede pedir? Megusta mucho que te hayas animado a contarnos tus secretos para conseguir eses seguidores todos en tan pocos meses, eso es posible? Increíble, eres un crack tio! Como se nota que ha sido un gran post por la cantidad de buenos comentarios que ya llevas en el post, y me encantó tu charla en 3 idiomas con Jorge! Ahhh mil gracias por la mención especial en el post, es un honor para mi aparecer en este gran artículo! Muito bom mesmo! Cláudio, solo ahora he visto tu comentario. Muchas gracias compañero! Con tu ayuda todo esto ha sido más fácil. Do you have any insight on this? Do they actually publish things like “Alfredo just used Tweepi” or does it mean that you can publish using the app? Excelente, muy muy muy interesante! First of all , congratulations on your article and how your followers at Twitter have gone through the roof. Only I tell you that I am applying your recommendations and my followers are soaring , glad to see my account in the last days. Awesome post!! Im launching my website and this will help me a lot in conjunction with the other things im using. Thank you! Great article. Questions though: how do you follow a thousand power day without hitting the Twitter limit? I.e 2,000 or 5,000 limit. Also, why is it so important that you don’t follow more than are following you? How are you supposed to follow a thousand a day and keep your followings below your number of followers if you only gain about hundred followers a day? Hi Astley thanks for stoping by and I’m really glad you liked! I’m not too sure if the limits changed now, but at the time I could follow 1000 every 24h, if the limit changed you need to follow according the limits, tweepi itself puts on those barriers. Regarding the second question, it’s a matter of perception, people will more likely follow you back if you have more followers than following.